I found this recipe on the Simply Recipes website. The flavor was fantastic, however we over baked them a tad so some of the seeds had a little burnt flavor. 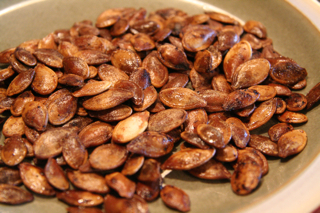 The picture shows a browned pumpkin seed, I would recommend watching them closely, especially if your oven runs hot. Preheat oven to 400°F. Cut open the pumpkin and use a strong metal spoon to scoop out the insides. Separate the seeds from the stringy core. Rinse the seeds. Spread about a tablespoon of olive oil over the bottom of a roasting pan. Spread the seeds out over the roasting pan, all in one layer. Bake on the top rack until the seeds begin to brown, 10-20 minutes. When browned to your satisfaction, remove from the oven and let the pan cool on a rack. Let the seeds cool all the way down before eating. Either crack to remove the inner seed (a lot of work and in my opinion, unnecessary) or eat whole.